whistles with colored safety tip. I Love those! If Whistles With Colored Safety Tip is what you are looking for these American Classic™ Whistle, nylon woven lanyard and Safe-T-Tip™ are creative unique gifts your whistle blower will love! Individually packaged American Classic™ Whistle, nylon woven lanyard and Safe-T-Tip™. Lanyard and Safe-T-Tip are available in red, white, blue, black, yellow and green. I thought to myself when I saw these whistles. Hay I've never seen whistles with safe-t-tips™ let alone colored safe-t-tips before! I thought they re pretty cool,stylish, cute. I can see matching colored whistles being blown by captains of cheer leading squads, or professional double dutch teams or any high school sports team. I can see them given as gifts to match team outfits. Given by parents to their daughters or sons as unique gift whistles. There is potential. Sure one may think, 'old fashioned, how will this work, I ain’t going to like it'. But I think of it this way... The very thing I like about these whistles is that of it's simplicity. One could just buy any colored whistle but to add color safe-t-tip™ to a whistle makes it fun. It could be an extension of team pride whether at a schools sports events or professional teams. 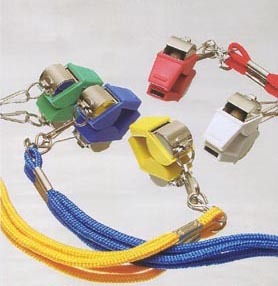 I recommend these whistles that match the teams colors. It so goes with the team spirit. These whistles with colored safety tips also known as 'the American classic whistles with the trade mark Safe-T-Tip™' are all American, hand crafted American classic whistles. So cute to match a cheerleaders outfit for fun. Individually packaged American Classic™ Whistle, nylon woven lanyard and Safe-T-Tip™. Lanyard and Safe-T-Tip are available in red, white, blue, black, yellow and green. This is my first Item (posted 11/10/13) of our extensive offerings specially chosen to reflect the esthetic of Geri's Specialty Gifts. See more great items to come! Experience the unique in unique gifts by clicking on the links below.